2 mile open water swim sans wetsuit and triple brick! 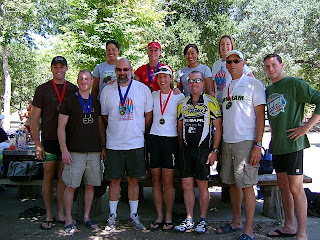 I took this week's training pretty light because I was still wiped from Vineman! I probably shouldn't have done Vineman 70.3 as a recovery workout as I went in exhausted, I did it exhausted and I was exhausted and sore for the next few days! Got a massage on Tuesday which helped some but didn't cure all! If only! This week's highlight of workouts included a 2 mile open water swim at Lake Del Valle in Livormore and the all feared Triple Brick with the team! Friday night, Deb and I dropped off dinner at Honoree Laura's house who is currently going through treatments. We got lost and ended up driving through the projects of Oakland! We then went over to Kristie's place for a slumber party and Zachary's Pizza! Saturday morning, we woke up bright and early, picked up Brian at the park and ride and headed to Lake Del Valle. The 2 mile open water swim sans wetsuit made me work a whole lot harder! Took me 1 hour and 34 minutes to complete..non-stop! I feel a lot better now about the IML swim having done this two miler without a wetsuit! Great afternoon of swimming and brunch! Sunday morning, Renee, Deb and I headed out to Danville for our Triple Brick workout. 30 mile ride followed by a 50 minute run..3 times! Thank goodness for Robin B. who accompanied me today. We both had our ups and down..definitely more downs for me. Physically, I feel run down and mentally, I am just exhausted! The third loop of the ride was pretty brutal and I barely survived it with tears welling up behind my sunglasses..twice! I think that's a sign of exhaustion all around! The wind tunnel in the middle of the ride didn't help but we all survived..myself barely but I survived and I guess that's what counts for today! 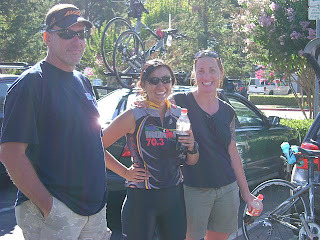 Total saddle time was 6 hours and 13 minutes covering 90 miles! Run was 2 hours and 30 minutes. What a day! After the run, I headed straight for the market for get the ice cold diet coke that I've been thinking about since the beginning of the third bike loop! Shortly after, I went back to the market for mac and cheese and spaghetti and meatballs! I was hungry! Ice bath never felt so good!